FIA Chairman since December 2018. A retired diplomat, John Duncan was Governor of the British Virgin Islands 2014 - 17. He was Acting Governor Falklands in 2014 and British Ambassador for Arms Control and Disarmament at the United Nations from 2006 - 11. During a 38 year career with the FCO, John had several postings covering the UK Overseas Territories, serving as Deputy head of the South Atlantic and Antarctic Department from 1996 - 8, Additional Director for FCO Overseas Territories Directorate from 2013 - 2014, and Director for Southern Ocean Territories 2017 - 8. He was one of the first FCO Bloggers and was Special Representative for the 2011 London Cyber Conference as well as FCO Director of Communications 2012 - 13. He is a graduate of the NATO Defence College and served both at UK Delegation to NATO and at SHAPE. After completing a degree at Oxford University, Tym joined the Army (The Parachute Regiment). During a career lasting 25 years he saw active service in Aden, Northern Ireland and the Falkland Islands. In addition, he served in various regimental and staff appointments including at the Royal Military Academy Sandhurst and the Ministry of Defence. After retiring from the Army in the rank of Lieutenant Colonel he worked variously as a management consultant to British Rail on the approach to privatisation and as a Chief Executive in the charity sector. Since ceasing full-time work, he acts as a member of the Tax Tribunal and as a Trustee of several charities including Falklands Conservation. He has visited the Falkland Islands with his wife on number of occasions and they have travelled widely around the islands. He has two daughters and four grandchildren. He took over the role of Hon Sec FIA in January 2016. I am a 4th generation Falkland Islander on my mother’s side. My family moved to the UK in 1975 when my father was posted back to the UK to help set up the British Antarctic Survey (BAS) HQ in Cambridge. My brother returned to live in the Falklands in 1986 and still does so. I joined the Foreign and Commonwealth Office (FCO) in 1990 and served with them for 25 years. I have had postings in Moscow, Washington DC and Canberra. I was also part of their Rapid Deployment Team for many years and travelled to China in 2008 after the terrible earthquake they suffered to look for, and give consular aid to missing British nationals. I have been back to the Falklands on several occasions for holidays, and each time I know I am home - especially when that first gust of wind hits me! I am a long-standing member of the FIA and, after being retired from the FCO on medical grounds, was able to take up the role Membership Secretary in 2015. I am a Falkland Islander who travelled to England in 1963, with the support of a Falkland Island Government Scholarship, to be educated in Dorset. I graduated as a teacher and taught in several Secondary Schools in Bristol and London before taking early retirement in 2004. I worked as an Education Consultant until 2010. I currently live in Bristol but visit my mother, who lives in Stanley, as often as I can. Between 1957 and 1960, I lived on South Georgia where my father was the Chief Wireless Operator. I recently wrote a book about this part of my childhood with the title "In The Shadow Of Shackleton's Cross”. David is a descendant of the Lafone family via his paternal grandmother. The Lafones gave their name to part of East Falkland which they bought in the 1850s. His father, Patrick Ainslie, was Chairman of the Falkland Islands Company in the 1950s – 60s. David first visited the Falklands from April - September 1966, and taught at Darwin Boarding School as a relief teacher for a term. He had time for a trip around the Islands on RMS Darwin, and to South Georgia for its Winter visit. After returning to the UK David attended university for three years, and then qualified as a Solicitor in 1973. He retired in March 2018. During his training in 1971 David was introduced by his father to Bill Christie who also worked in Lincoln’s Inn, and became a member of the UK Falkland Islands Committee that year. He has remained on its successor organisations (now the Falkland Islands Association) to this day. In 1981 Bill Christie proposed forming a UK charity to undertake projects related to the Falklands. 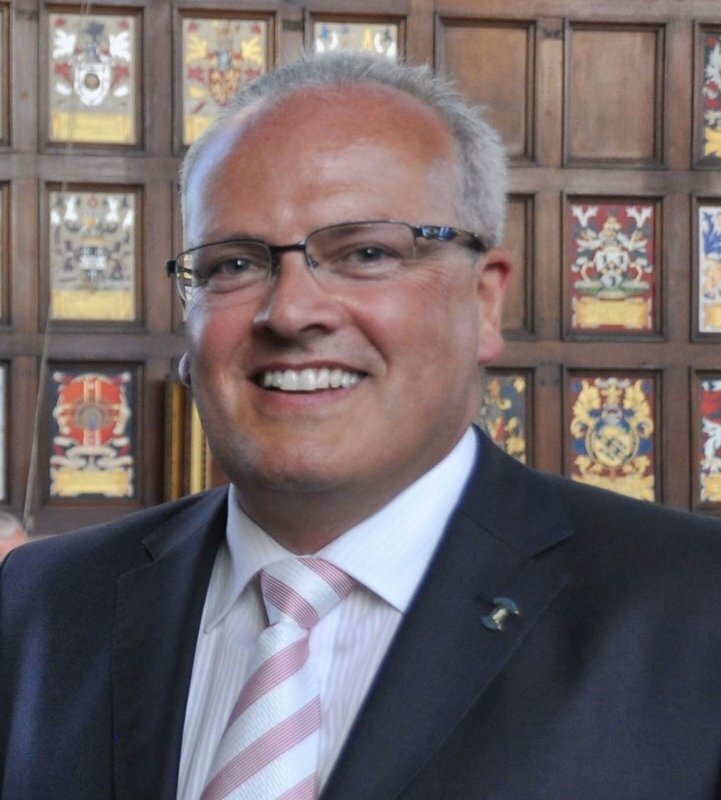 David as a charity law specialist set up the UK Falkland Islands Trust and has been UKFIT Chairman since 2008. David has been married to Catherine for 25 years, and they have two adult sons, Jonathan and Richard. Personal interests include fishing, and David fulfilled an ambition to catch a sea trout in The Falklands, during a visit in November 2018. My interest in the Falkland Islands really began when I met and subsequently married Robert who served both on NP8901 in 78-79 and again on HMS Endurance prior to and during the conflict. My association increased further in 1986 when Robert and I moved to Stanley to live. Robert worked as a Policeman before joining Fisheries Protection, ultimately ending up at Falkland Farmers whilst I worked for Standard Chartered Bank in Stanley. We remained in the Islands for 2 ½ years getting to know the people and the Islands well and we still have many friends there. I currently live in Devon with Robert and work for Devon and Cornwall Police who are the supporting Force for Falkland Islands Police. Other than 1986, I have been back to the Falkland Islands twice (but have still not seen as much of it as I would like) and to South Georgia once when I was able to see where Robert “did his bit” during the conflict. My first visit to and contact with the Islands was in 1982 when I deployed with the Task Force as Commander of the Army’s Port Squadron. Following the cessation of hostilities I remained in Stanley until the October setting up the port operation for the ongoing support of the Garrison. In 1995 I returned for a posting with HQ BFFI with my family for a 15 month tour of duty (working for Peter Johnson as CBF!). I joined the FIA and Falklands Conservation, subsequently becoming a Trustee of the latter (2007 – 2011). I am a member of SAMA 82, was a Trustee from 2008 to 2014 and chairman of Trustees for the last 4 of those years. A FIA Executive Committee member since 2001 and Chairman of the UK Falkland Islands Trust from 2000 to 2008. Born and educated in Oxford. 36 years in the Royal Air Force as a fast-jet pilot, manager and commander, serving in UK, Germany, Cyprus and the USA and as Commander British Forces Falkland Islands from June 1994 to August 1995. Retired from the RAF in 1999, then one year as consultant to a local project management business based in High Wycombe and as a part-time maths teacher at a College of Further Education, followed by 8 years as Chief Executive of the Regular Forces Employment Association. Now retired from paid work but heavily involved in a number of charities and other local and national organisations. Live in the Chiltern Hills with wife Jill and blessed with four children and five grandchildren. I joined the FIA after forty years in the Royal Navy specialising in nuclear submarine propulsion. Indeed, I first saw the Islands (1983) from the casing of HMS Spartan for all of five minutes before the cold drove me back to the warmth below! Twenty years later my wife, Sarah and I were sent there by the Navy for a one-year appointment in Commander British Forces’ (CBF) HQ. That appointment turned to eighteen months and was followed by a further five years as the Civil/Military Liaison Officer based in Stanley. We have travelled extensively around the Falklands both privately and professionally (escorting CBF on farm visits) including all but one of the inhabited islands. We became Falkland Islanders in 2008. Although Sarah’s on going health checks have prevented us running our planned mini lodge, we have homes in both the UK and FI, travelling every equinox to maintain summer! I lived at the military base on the Falkland Islands between June 2001 and April 2003 and during this time visited as many of the settlements and met as many residents as possible. I left feeling inspired by the wildlife, scenery and life stories I had seen and heard, and the passion for the Islands felt by the residents. This included their sincere thankfulness for the Military Personnel who came and recovered the Islands, as well as their continuing resolve to remain linked with the the United Kingdom. That is why I joined the FIA to help make sure all freedoms are preserved and why I have volunteered for Veteran Outreach Support, a charity founded by Falklands Veterans. My interest in the Falkland Islands really began when I renamed HMS ENDURANCE in 1968. She was the Falkland Island's guard ship and the Navy's ice patrol ship for many years. My interest increased when my father, Lord Shackleton, produced the 1976 and 1982 Reports on the Islands.He was the youngest child of Ernest Shackleton. I have a History degree from Trinity College Dublin. I was Sponsor of HMS ENDURANCE for 23 years, Bob Turner was my last Captain. I am currently Sponsor of the BAS ship RRS Ernest Shackleton. I have been to the Falkland Islands 8 times, South Georgia 3 times & the Antarctic 4 times & I am a member of associated committees. I have spoken in many countries on Shackleton's leadership & been Patron of several Polar Expeditions. The first time I heard of the Falkland Islands was when I was at home two weeks into a six week annual leave programme; whilst sat watching TV there was a news flash announcing that Argentina had invaded the Islands. I contacted P & O with whom I was employed at the time and was instructed to go to Southampton to re-join Canberra. The first time I saw the Falklands was in the dead of night on the 21st May as we passed Fanning Head making our way into San Carlos Bay. The rest as they say is History. Now all these years later I believe it is important that we engage with the younger generation to ensure that this important event is not forgotten. Paul, was a member of the Falkland Islands Association Executive Committee from 2013 to 2015 and again since March 2019. He is a retired member of HM Diplomatic Service where he served as Deputy Governor in the Falkland Islands (and Deputy Commissioner for South Georgia and the South Sandwich Islands) from 2007 to 2010. Before that was Head of Southern Cone Section of Latin America Department at the Foreign and Commonwealth Office with particular responsibility for Argentina, Chile, Uruguay and Paraguay. Paul's 38 year FCO career also included overseas postings to the USA, Peru, Mexico, Uruguay, Jamaica, France and Ireland and he also served as the Assistant Private Secretary to the FCO Minister of State which included accompanying the Minister on an official visit to the Falkland Islands in 1991. Tamsin is a Falkland Islander by birth and has been a member of the Association since 1991. She has lived all over the world, firstly while working in the FCO and since accompanying her husband; the family are now settled in the UK. She recently completed her BSc(Hons) in Social Sciences with Social Policy and Sociology and is a Verger at Peterborough Cathedral.